White House Press Secretary Sarah Sanders has said that CNN 'disrespected' President Donald Trump while responding to the news network's claim that the administration pulled the plug on an interview with National Security Advisor John Bolton. Bolton was scheduled to appear on CNN's State of the Union with Jake Tapper on Sunday, but Tapper in a tweet claimed the White House killed the interview after it was 'locked in'. 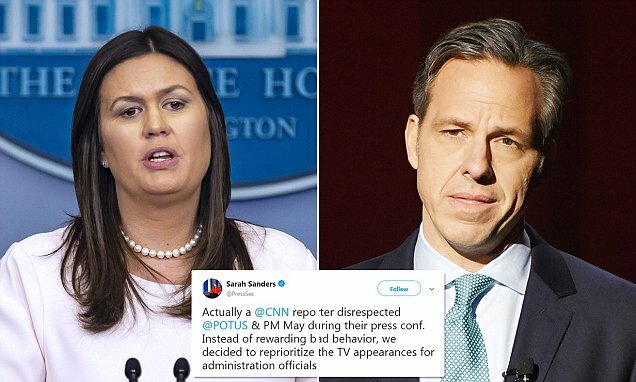 Tapper was referring to Trump's dismissal of CNN correspondent Jim Acosta at a Friday joint press conference with British Prime Minister Theresa May. The incident that sparked the latest round of feuding between Trump and CNN occurred at Chequers, the prime minister's country home outside of London. Later, as Trump looked across a crowd of journalists with raised hands, deciding who to call on next, Acosta made loudly demanded a chance to participate in the press conference as compensation for the president's attack on his employer's honor.